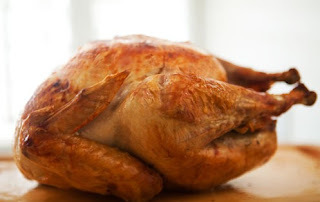 With thanksgiving just a few days away, I thought I would share some of my tips & tricks for cooking a perfectly moist and golden brown turkey. I have been helping my mom cook the turkey for years, and for the past couple of years I have been cooking it on my own at my moms and my dads. It is something I really care about, because who wants to eat dry meat?! Cooking a delicious turkey is not always easy, and it definitely requires a close eye, a thermometer and lots of butter! 1. Also rub the bird down with butter before you roast it (you can either use melted butter, or soft butter). Make sure to lift up the skin above the breasts gently in order to put a few knobs of butter. Smooth them around with your fingers. 2. Always season your turkey! Lots of fresh cracked pepper and kosher salt does the trick. I never season the outside with anything else but good old S&P. 3. Try bringing your turkey. This is the first year that I am going to brine my turkey - and I am already so excited. With my first dinner tomorrow, I already started the brining process this morning. Make sure to give it a good 12-24 hours of bring time. For a good recipe brine check out Michael Smith's HERE. 4. The Brown Paper Bag. This is the best trick I have learned my mom and grandmother. In order to get that perfectly crisp and golden brown skin, we cover the turkey with a brown paper bag that has been smeared all over with butter. This is foolproof and will ensure your guests have the best looking turkey! 5. How much time per pound? I like to cook my turkey for about 12 minutes per pound. We generally get a 12lb turkey, so about 2 hours and 20 minutes is perfect. Remember the turkey will always cook a little bit more once you take it out! You want the temperature to be around 160-165. Always test with a meat thermometer, and make sure you test not only the breast but the thigh as well. The thigh cooks slower than the breast, so you have to make sure that is also done! 6. REST YOUR BIRD! Don't let all those beautiful turkey juices escape. It is vital to rest your turkey for a good 20 minutes before carving it up. The rest time allows the juices to settle down and re absorb into the turkey meat. 7. Carving, who gets to carve the turkey?! In order to maximize your yield of turkey meat, I recommend cutting the breast as a whole completely off the bird and then slicing from there. Its much cleaner and you keep way more meat!